In our steady quest to visit all the National Parks, we stopped at Arches NP on our way home from this road trip. We had stopped last year in the Colorado Plateau region that makes up the 4 corners region of Colorado, Utah, Arizona and New Mexico, climbing the soft rock in St. George and seeing Hoodoos and slot canyons in Arizona, the fins, windows, and spires of Bryce Canyon, and the giant cliffs in Zion. Driving through hundreds of miles of this landscape, you can't help but contemplate how vast and beautiful it is, and how erosion has created such different terrain. There's about 20 national parks and monuments in the Colorado Plateau preserving these natural formations. Arches NP is located in Eastern Utah, just 30min outside Moab, and within an hour from Indian Creek (Bears Ears National Monument) and Canyonlands National Park. There's over 2000 arches, though only a handful are easily recognized from popular photography. And while the color and texture of the soft red sandstone is very reminiscent of Zion and Bryce Canyon, it creates different formations. In Arches NP, there's a layer of softer Entrada Sandstone on top of harder Carmel Sandstone. The 8-10in of rain a year seeps through the Entrada layer, and pools on top of the Carmel layer, slowly eroding the Entrada layer from the bottom, eventually forming arches (great video). You can see most of the park in 2 days assuming there aren't hordes of people during the busy summer season. Our favorite time to visit National Parks is fall into winter, when there's hardly anyone in the parks and the temps are perfect for hiking. 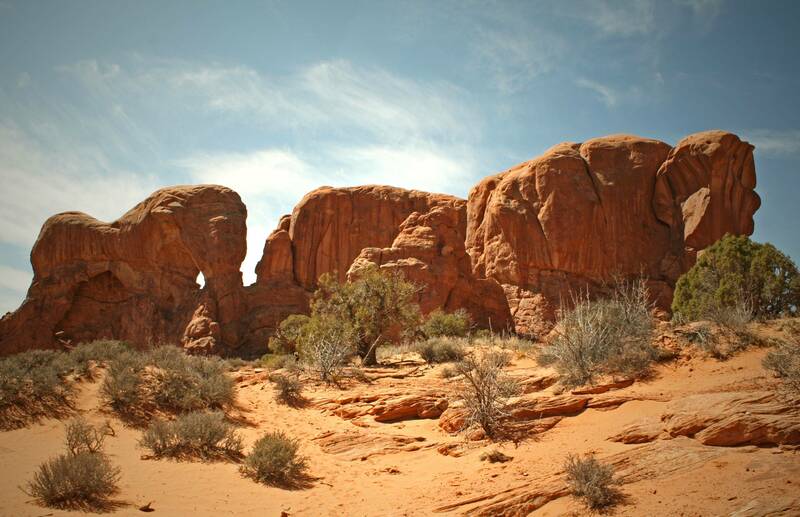 There's one campsite, Devil's Garden, with 40 sites in Arches NP with water and flush toilets, but no showers. Most people camp in Moab, just 10mi from the park entrance, and make day trips in. Indian Creek, an hour away, is another option--it's all BLM land, primitive camping with no water and only pit toilets, but very well maintained. We got spotty cell reception in the park. We picked up Verizon, AT&T, and T-Mobile at various places and in some spots in the Devil's Garden campground. The Visitors Center has free Wi-Fi. Park Avenue Viewpoint. It's what I imagine walking into a temple of the gods feels like. The thin, stacked rocks creating the walls takes your breath away. Our biggest surprise was Delicate Arch, perhaps the most famous and well-photographed arch. You almost always see it head-on, taking up the entire frame, and I've never seen photos that do justice to the surrounding landscape. I didn't expect it to be so surreal. The arch sits at the lip of a smooth, angled sink/toilet bowl, with tall fins and canyons flanking the backside. Delicate Arch with Canyonlands and Moab in the distance. View from the backside of Delicate Arch. The other hotspot for arches and perhaps second well-recognized from photography is the Double Arch. Parade of Elephants from Double Arch. With a better angle to the right and in front of the pillar, they actually look like elephants. The arch creates the trunk of the following elephant. The southern span of Double Arch soars 112 feet (34 meters) above ground level. It is also the second-longest arch in the park, at 144 feet (44m) across. Looking up from inside Double Arch. Would be awesome to get milky way or supermoon shots from under here! View toward parking lot from under Double Arch. You can see most of the iconic arches from roadside overlooks and 1-3mi round trip, mostly flat walkways. The longest hike is about 7.5mi of the Devil's Garden Trail, which as a bonus starts at the campground. Landscape Arch from the Devil's Garden Trail, about 1.5mi from the trailhead. At 306 feet wide it's the longest arch in North America. The full Devil's Garden Trail loop includes about 4mi of a primitive trail marked by cairns, and takes you through awesome landscape. Primitive trail. It's "primitive" in that you're not on 3-foot-wide tourist paths, but you're fine in good hiking shoes. Double O Arch from Devil's Garden Trail. Traversing Devil's Garden Trail at sunset. Devil's Garden Trail near Navajo and Partition Arches. Nearing end of the Devil's Garden Trail.